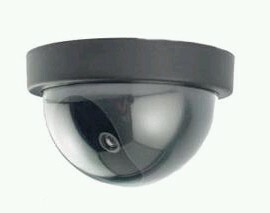 Sometimes a dummy CCTV dome camera can serves your needs just as well at a small fraction of the cost to install a real CCTV camera. This fake CCTV camera is indistinguishable in design from a real security camera. 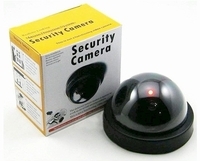 Some of our customers mix these dummy cameras with at least 1 real working camera for a cost effective solution with money savings.. The Red Blinking LED light makes it seem like a real operational security camera that serves as an excellent deterrent & warning for thieves. It can be placed easily indoor in your office, house, office or shop, basically wherever you need it. The unique design makes it easy to mount on walls or ceilings with no messy wiring necessary.